KE00047 is a solid phase sandwich Enzyme Linked-Immuno-Sorbent Assay (Sandwich ELISA). 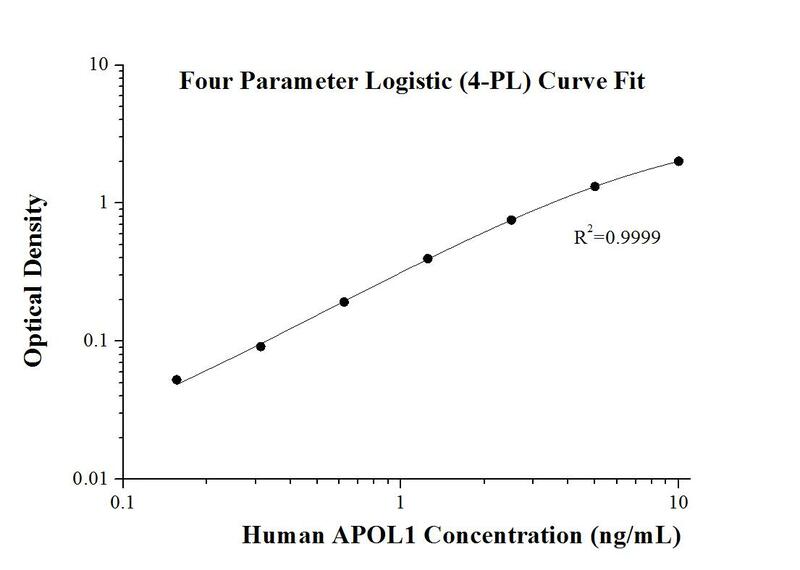 The APOL1 ELISA kit is to be used to detect and quantify protein levels of endogenous APOL1. The assay recognizes human APOL1. A polyclonal antibody specific for APOL1 has been pre-coated onto the microwells. The APOL1 protein in samples is captured by the coated antibody after incubation. Following extensive washing, a monoclonal antibody specific for APOL1 is added to detect the captured APOL1 protein. For signal development, horseradish peroxidase (HRP)-conjugated antibody is added, followed by Tetramethyl-benzidine (TMB) reagent. Solution containing sulfuric acid is used to stop color development and the color intensity which is proportional to the quantity of bound protein is measurable at 450nm with the correction wavelength set at 630 nm. All the reagents are stored at 2-8℃. Refer to the protocol for further storage instructions. Human apolipo-protein L1 (APOL1) is a minor component of plasma high density lipoprotein (HDL) particles. The human ApoL protein family was thought to be predominantly involved in lipid transport and metabolism. APOL1 is also involved in host innate immunity against Trypanosoma parasites. Once activated, APOL1 can lyse the parasite and protect human from infection. Genetic variants in APOL1 gene, which are found in African ancestry with high frequency, associate with chronic kidney disease, like focal segmental glomerulosclerosis (FSGS), HIV-associated nephropathy (HIVAN), and hypertensive nephropathy. This kit is used to quantify APOL1 level. Vascular smooth muscle cells contribute to APOL1-induced podocyte injury in HIV milieu. Novel diagnostic cerebrospinal fluid biomarkers for pathologic subtypes of frontotemporal dementia identified by proteomics. A tripartite complex of suPAR, APOL1 risk variants and αvβ3 integrin on podocytes mediates chronic kidney disease.